With the war intensifying, desperate attempts were made to grasp victory. British soldiers were sent across the seas in search of a breakthrough, and East Sussex men were amongst them. As it became apparent in early 1915 that the Western Front had descended into trenches and stalemate. Allied leaders began to look further afield for locations where a second front could perhaps be opened against the Central Powers and a breakthrough could be made. The Ottoman Empire had been nominally neutral at the outbreak of the war but a mixture of territorial promises from Germany and an attempt by Britain to exert control over the Turkish navy had led to a collapse in relations. Turkey entered the war on the side of the Central Powers on 31 October 1914 with Russia, Britain and France all declaring war on it within 5 days and the Ottoman Empire declaring a jihad in response later in November. The bulk of the early fighting involving Ottoman soldiers was in the Caucasus region against the Russians. By forcing Russia to defend this region, however, the Ottomans ensured that soldiers had to be diverted away from the Eastern Front where they had been engaging the Germans. If this trend continued, the German and Austro-Hungarian armies on the Eastern Front might have been able to break the Russian resistance. As a result, Russia called for aid from France and Britain. Before they were closed at the outbreak of war, the Dardanelles Straits, a narrow strait that cut through north-west Turkey, had provided trade access to Russia from the Mediterranean and Aegean Sea. They also provided access to the Sea of Marmara and, eventually, the Ottoman capital Constantinople. The original plan forwarded by Winston Churchill was to send a naval expedition made up of obsolete cruisers and battleships, that would not have fared well in combat against the German fleet in the North Sea, and use them to destroy Ottoman defensive positions on the coast and force the Straits. This attempt ended in disaster when several British and French ships were sunk by a mixture of artillery fire and mines. As a result, it was decided to launch an infantry landing that would seize defensive forts at the narrow portion of the Straits and allow Allied naval vessels to advance through unmolested. The landings themselves were carried out by a mix of Australian, New Zealand, British and French soldiers arriving at beaches now commonly known as Anzac Cove and Helles Sector. The sheer cliffs and unforgiving terrain near the beaches created a difficult environment in which to wage war. Whilst the Allied forces did make some gains, they struggled to advance far beyond the beaches in the weeks following their arrival or push in land towards their objectives. 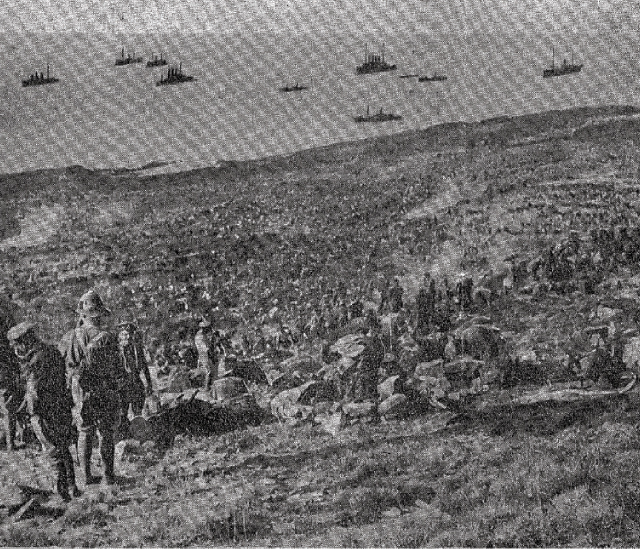 To try and draw Ottoman defenders away, it was agreed to stage a second landing at the Suvla Bay. Among the forces that staged this new landing were the 4th Battalion, Royal Sussex Regiment, who arrived ashore during the night of 8-9 August 1915. Whilst initially facing no strong organised opposition, the British forces once again failed to take advantage of the situation and the area descended into the now all too familiar trench warfare. 2:45am – Party of 30-40 Turks approached Trench held by A Company probably with intention to throw bombs. The alarm was given and fire opened. Enemy halted and returned the fire & did not push attack further. 3 Turks killed and collect 8 rifles & 140 rounds of ammunition were collected also 1 bomb. Our casualties 1 man killed. It rapidly became clear that a breakthrough at Gallipoli not forthcoming. Worse still, the entry of Bulgaria into the war on the side of the Central Powers meant that Germany could now send forces overland directly to the Dardanelles if it so chose. The entire Allied force now risked destruction if left to face any German artillery or a harsh winter trapped on the beaches. As a result, a full evacuation was ordered and the 4th Sussex Battalion left Suvla Bay on 13 December 1915. The rest of the Allied army were also transported away from the Straits in defeat. In time the 4th Sussex Battalion would go on to serve in Egypt and the Middle East before eventually returning to the Western Front in 1918. The Ottoman Empire was able to claim a great victory at Gallipoli that would eventually play a key role in the formation of the Turkish Republic. Britain and France would turn their attention away from a second front at the Dardanelles and instead concentrate on dealing with Germany in Europe. This decision would also have grave consequences for Sussex soldiers.